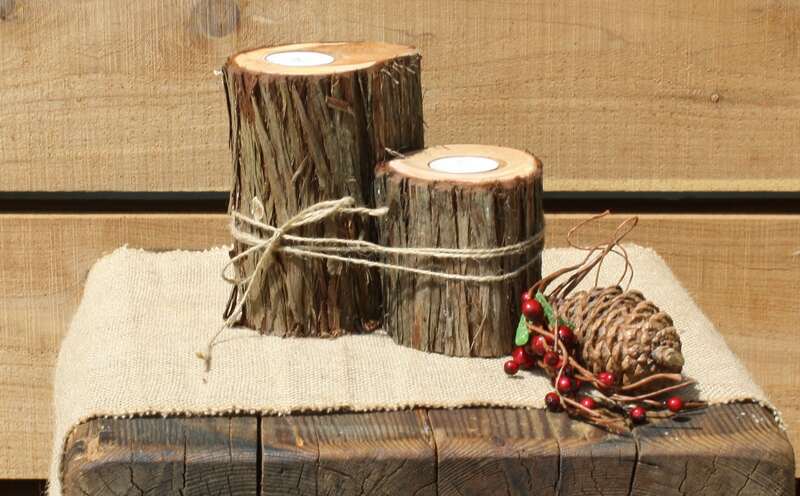 This new item is the perfect addition to your rustic table setting or centerpieces. We're so grateful to our customer that requested/suggested these items. These candle or votive holders (cedar tree stump/branch) measure about 3" to 6" in height and have a diameter of about 3" to 5" at the widest part across. These measurements will vary somewhat as each set is made to order. There are 2 pieces per set, with one being "tall" and one being "shorter" - so there is a staggered look to the heights of the arrangement. We just love the rustic wedding trend and have lots of items to show you! Note: this is a completely natural wood product. You will find some saw dust residue on them, the bark will flake and/or peel somewhat. The surface may also lightly crack as it dries out. It also strongly smells like cedar. Some very brave bugs may also make their way to you. We are literally cutting these from our woods, and shipping them to you! 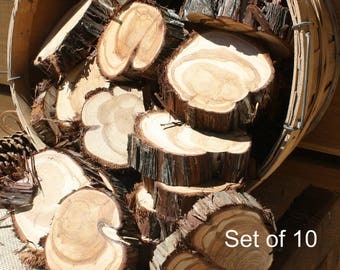 None of this will affect their intended purpose and is completely a natural characteristic of a fresh cut wood product. Just want you to know. I was a little confused, because one seems to have glitter on it, but the others do not (I bought 2 sets). But I still love it, just confused lol. I would buy from them again for sure! FAST Shipping! The cedar tree slice arrived on time and the piece looks elegant.